Hollywood in the Neighborhood presents a vivid new picture of how movies entered the American heartland—the thousands of smaller cities, towns, and villages far from the East and West Coast film centers. 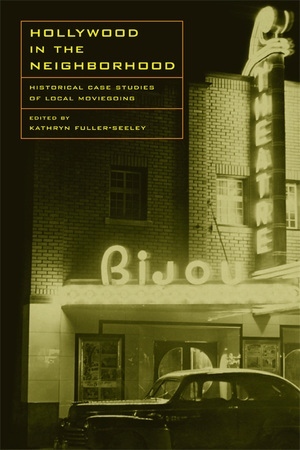 Using a broad range of research sources, essays from scholars including Richard Abel, Robert Allen, Kathryn Fuller-Seeley, Terry Lindvall, and Greg Waller examine in detail the social and cultural changes this new form of entertainment brought to towns from Gastonia, North Carolina to Placerville, California, and from Norfolk, Virginia to rural Ontario and beyond. Emphasizing the roles of local exhibitors, neighborhood audiences, regional cultures, and the growing national mass media, their essays chart how motion pictures so quickly and successfully moved into old opera houses and glittering new picture palaces on Main Streets across America. Kathryn Fuller-Seeley is Associate Professor and Associate Chair in the Communication Department at Georgia State University. She is author of At the Picture Show: Small Town Audiences and the Creation of Movie Fan Culture among other books.